DOHA, Qatar, 2017-Dec-04 — /Travel PR News/ — Qatar Airways today announced its accreditation to the highest level of the International Air Transport Association’s (IATA) Environmental Assessment programme (IEnvA). Exceeding its deadline set in March 2016, Qatar Airways is the first airline in the Middle East, and the fifth worldwide, to achieve IEnvA Stage 2. 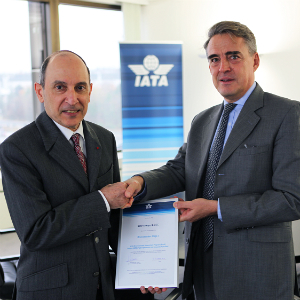 Qatar Airways Group Chief Executive, His Excellency Mr. Akbar Al Baker, was presented with the IEnvA Stage 2 certificate by Mr. Alexandre de Juniac, Director General and Chief Executive Officer of IATA, during H.E. Mr. Al Baker’s inaugural meeting as the new Chair-Elect of IATA’s Board of Governors in Geneva on 01 December 2017. On accepting the certificate, H.E. Mr. Al Baker said: “I am proud to receive this acknowledgment of our success in developing and embedding a comprehensive environmental management system in the year we celebrate our twentieth anniversary. Looking back over the last two decades, we have transformed from an emerging regional airline to a world leader in aviation. As we continue to build our global network, we remain committed to dedicating the leadership and resources needed to meet our vision for environmental sustainability. Through its environmental management system, Qatar Airways has implemented a range of initiatives to improve environmental performance. This includes Qatar Airways’ systematic approach to aviation fuel efficiency, which focuses on weight reduction, route optimisation, and aircraft performance. This initiative has delivered savings which include 1,800 tonnes fuel (5,600 tonnes CO2) through optimising potable water upload, and 4,800 tonnes fuel (15,300 tonnes CO2) by reducing the use of engines while taxing on arrival at Hamad International Airport. Further, the environmental management system has reinforced business processes to improve how the airline engages its suppliers. In particular, it has launched a new Sustainable Procurement Charter and promotes the use of sustainably-sourced items within its award winning in-flight catering. A central part of Qatar Airways’ Environmental Management System involves providing its employees with the skills to deliver effective environmental management on a day-to-day basis. During 2016, in partnership with the Institute of Environmental Management & Assessment (IEMA), Qatar Airways launched a leading-edge environmental competency matrix to set skill requirements for every employee and incorporated environmental responsibilities into the job descriptions of all airline employees globally. Qatar Airways is now developing innovative environmental training packages, including interactive and engaging e-learning modules, which will engage its workforce in environmental management and contribute to business resilience. Qatar Airways has been an active member of IATA’s Environment Committee since 2009. This policy group of appointed airline representatives focuses on aviation industry solutions for environmental challenges, including climate change, illegal transportation of endangered wildlife, cabin waste, alternative fuels and social responsibility. Qatar Airways has recently accepted the nomination to Chair IATA’s Environmental Assessment Oversight Council – the body which provides governance over the IEnvA programme Standards Manual on behalf of its members. This entry was posted in Airlines, Travel, Travel & Environment, Travel Awards, Travel Management and tagged Environmental Assessment programme, H.E. Mr. Al Baker, IATA, IEnvA Stage 2, Mr. Alexandre de Juniac, Qatar Airways. Bookmark the permalink.